NEW yORK, NY. — Former NBA star, Clyde Drexler, will appear at NBA All-Star Weekend Pop-Up Store on Saturday Feb.. 14, 2015 to sign autographs and memorabilia. The signing will be from 11:30 am to 1:30 pm at the NBA All-Star Weekend Pop-Up Store located at 47th & Lexington Avenue in NYC. For more info, click here. Photo shows Clyde Drexler speaking about his Mt Rushmore picks with Complex News Feb. 2014. 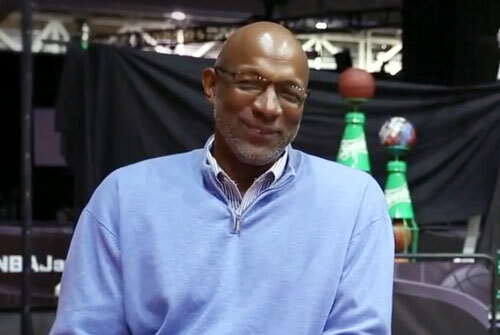 Watch Clyde Drexler speaking about his Mt Rushmore picks with Complex News Feb. 2014. Clyde “The Glide” Drexler is a former NBA shooting guard and small forward, who played for both the Portland Trailblazers & Houston Rockets. He was also part of the 1992 Olympic Dream Team and was inducted into the HOF in 2004. He is a ten-time All-Star and member of the Basketball Hall of Fame, and was named by the NBA as one of basketball’s fifty greatest players as of 1996. If you would like to book Clyde Drexler for an appearance, contact Clyde Drexler’s booking agent at Sports Speakers 360 for fees or call 1.855.303.5450.